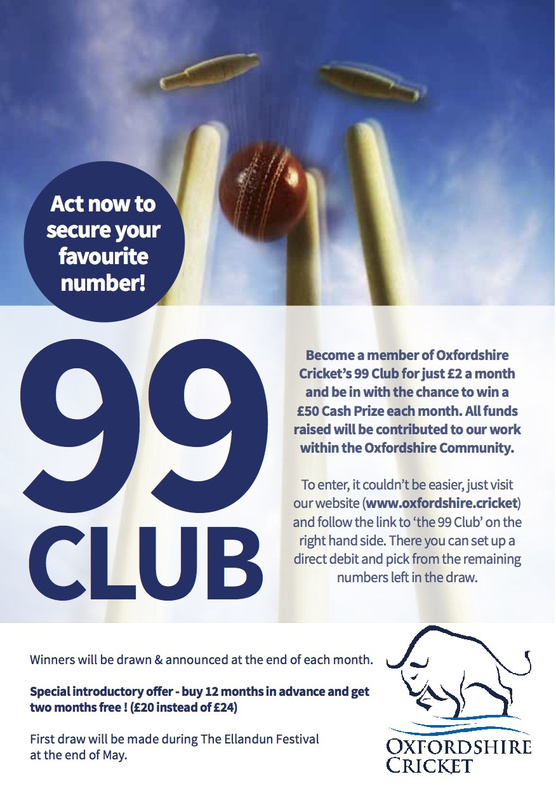 Oxfordshire Cricket "99 club" members can pick their own lucky number between 1-99 (subject to availability) and for just £2/ month will be in with a chance to win various prizes, including a first prize of £50 cash each month. Winners will be drawn & announced at the end of each month. We have a special introductory offer - buy 12 months in advance and get two months free! (£20 instead of £24) so act now to secure your favourite number! The first draws will be made at an Oxfordshire Cricket event each month. To purchase the year introductory offer - £20 for 12 draws please click here. To purchase on a monthly basis - £2 per month please click here.